CARACAS, Venezuela (CNS) — A year ago, Miledi Berdu and her husband, Robert Rodriguez, began skipping meals to keep their children fed as Venezuela’s economic crisis continued. Rodriguez’s salary as a welder in Caracas was not enough to cover soaring prices, and shortages made food expensive. One day, Berdu would skip lunch, then the next day, Rodriguez would go without dinner. The goal was to keep their 10-year-old daughter and 2-year-old son from going hungry. Berdu, already slim, dropped 11 pounds. Sisters Teresa Gomez and Yexci Moreno of the Congregation of Our Lady of the Immaculate Conception of Castres say cases like this are becoming too common. To better understand the scope of the problem and help push humanitarian and official organizations into action, the sisters have teamed up with Caritas Venezuela, the local chapter of Caritas Internationalis, to run nutrition clinics for children under 5. 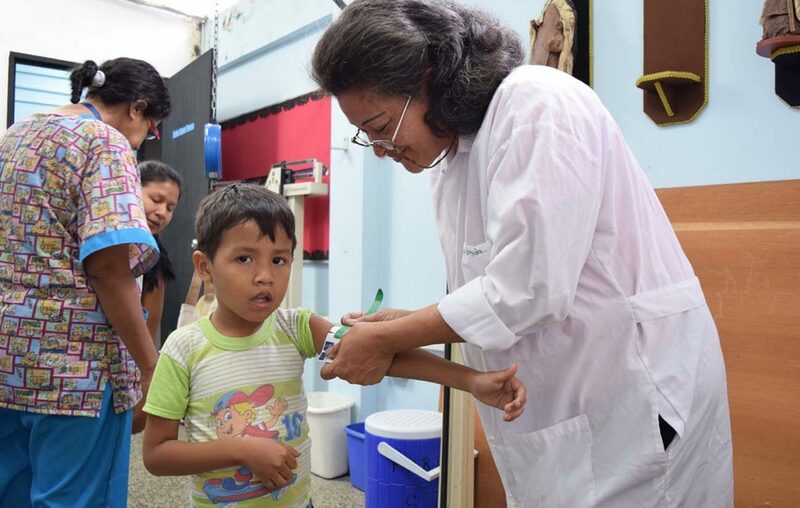 On Saturdays, the nuns’ preschool in the low-income area of Propatria becomes a hive of activity as volunteers and doctors weigh, measure and examine local children at no cost. The clinics — called Survey System for Monitoring, Alerting, and Attending to Health and Nutrition, or SAMAN in Spanish, are designed to collect and monitor statistics and help malnourished children. Berdu and Rodriguez were aware that, despite their best efforts, their children’s diet fell far short of qualifying as balanced. They brought their 2-year-old, Elias, to the SAMAN clinic in September, when they learned that the changes in portion sizes and types of food and the inability to find formula and vitamins had damaged Elias’ health; he was severely malnourished. In addition to gathering information, the SAMAN program also follows up with malnourished children, checking for parasites and providing them with a supplement of vitamins and nutrients to be taken twice daily. The daily supplement helped Elias reach a normal weight and size, and now he is healthy. Over the past few years, Sisters Gomez and Moreno have watched as their community and the children who attend their school suffer the effects of Venezuela’s faltering economy. Their school serves 110 children, ages 3 to 6, providing children with both breakfast and lunch. Sister Moreno said she has noticed that, after summer vacation, increasing numbers of children arrive at school underweight, skinny and often sick. After weighing and measuring on the first day of school, the numbers often confirm the adults’ worries. While the sisters help lead the weekly SAMAN clinics in their preschool, another worry remains present for them: the state of their school. After 30 years of operation, the two sisters now doubt whether the preschool will meet government code to open another year, mainly because of constant leaks. The economic problems for the sisters at the preschool come as the result of an economy in free fall. Reuters reported that in 2016, Venezuela’s inflation reached 800 percent and the economy shrank by 18.6 percent. The country, which relies on oil for 96 percent of its export income, has long lived through boom-and-bust cycles according to the price of oil. But many consider the current economic downturn, now in its fourth year, to be the worst the country has seen. Without currency for crucial imports and with price controls in place, shortages of basic foods, medicines and other household products have become commonplace at traditional stores. Many poor and middle-class Venezuelans spend hours, sometimes full days, in lines outside of pharmacies and supermarkets, waiting for the limited goods to arrive. Some have even have started to turn to the city’s trash to look for food. The company that used to donate lunches to the sisters’ school canceled those donations. As a result, the sisters now face the daily challenge of finding the school’s food at affordable prices, which means they often hit the streets with other Venezuelans at 3 a.m. to wait in lines at local supermarkets. The school faces structural issues, too, and is in danger of now being allowed to reopen for another year. Recently, Sister Moreno found roofing materials to fix the school’s leaks, but by the time she raised the money the cost had gone up nearly threefold. The sisters worry that if the school closes, young children will miss out on their meals. Last year, the school started offering classes to parents with tips on how to prepare cheaper meals using ingredients that remain readily available but are traditionally not popular in Venezuela. The nuns also organize weekly soup kitchens. “We even have people who are eating plantain peels, which is great,” Sister Moreno said. Plantains and bananas are staples of the Venezuela diet, but the peels are rich in vitamins B-6 and B-12, magnesium and potassium, too. Instead of tossing the peels in the trash, Sisters Moreno and Gomez encourage those participating in the alternative cooking classes to boil them and eat them as a side dish. The weekly soup kitchens serve hundreds in the community on Saturdays, and many of those people also attend the SAMAN clinics. The sisters use whatever ingredients they’ve managed to accumulate during the week to make vats of soup and rice, although they worry that one weekly meal does little to alleviate hunger. The weekly nutrition clinics at the preschool and in other centers, most of them Catholic schools and churches, will continue. For mothers like Iyudelsi Avila and her 18-month-old daughter, Rebecca, the program could not have come sooner. Because Avila was unable to get her hands on formula and because her poor diet affected her breast milk, Rebecca arrived at the SAMAN clinic weighing a little over 15 pounds, a weight she had maintained for several months. But within a month of receiving the nutrients from SAMAN, Rebecca gained 4 pounds. “Now she has an appetite that you couldn’t imagine, and she sleeps sometimes until 10 a.m.,” Avila said.